The 2010 pantomime for the Lyceum Theatre, Crewe is Aladdin and runs from 1st December 2010 - 2nd January 2011. To find out more about this panto visit the venue's webpage, or visit our Facebook photo album. 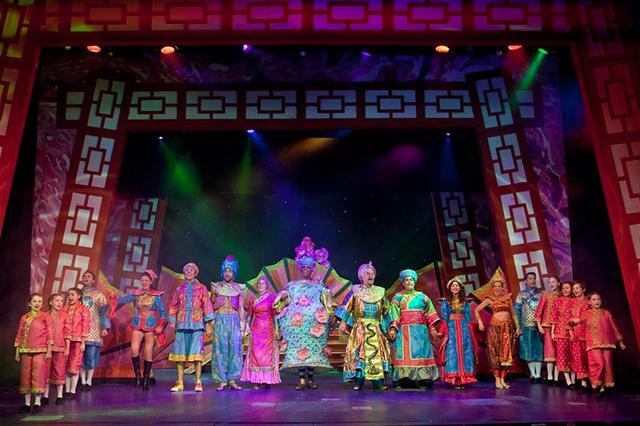 Follow us on Facebook to keep up with all the pantomime news! A MASSIVE thank you to everyone who was involved in Aladdin! The panto is now closed. Most importantly, thank you to our audience for supporting us. We hope you had a great time and that you join us for Snow White in 2011/12! Meet Ayesha Gwilt (who plays Amy Porter in Waterloo Road) about her role as Spirit of the Ring in this years panto, and what her favourite type of performing is! Due to Waterloo Road filming commitments, she couldn't make the main Crewe photo shoot, so she joined us in Halifax. Here are a couple of photos of the day. 7th September 2010 - The panto is launched! Today 8 of the 9 principal cast members, plus Karl the pantomime director and members of the Imagine Theatre team, met at the Lyceum Theatre to launch the panto. Visit our Facebook photo album for loads more images! 5th September 2010 - The Babes are cast! We are delighted to announce that Leon Craig returns for his second year as Dame, to play Widow Twankey. And we're also delighted to announce another 'Craig' - this one's Craig Hollingsworth and he plays Wishee Washee. 18th June 2010 - Four more cast members announced! 7th May 2010 - First cast member is announced! We are delighted to announce that Tachia Newall who plays Bolton Smilie in Waterloo Road will be joining the cast of Aladdin to play the Genie of the Lamp.